When we started out over 20 years ago we could not ever have imagined regularly serving platters of sushi in Scotland, but we have fallen in love with it, for the same reasons that the Japanese enjoy it. 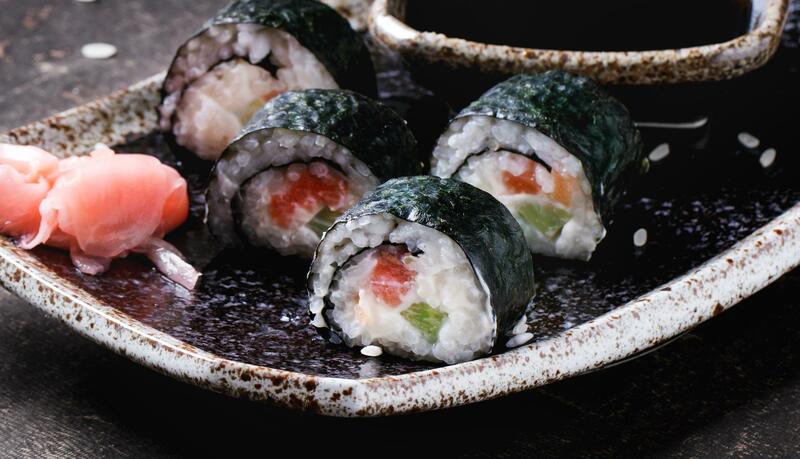 The term “sushi” originally referred to the fermented rice that was used to preserve fish.. Although its origins go back much further, outside of Japan even, closer to the Mekong delta, the sushi that we would recognise today goes back to the early 19th century, a man (named of Hanaya Yohei) made it popular with a major change in the way that sushi was both made and presented. No longer older fish preserved by being wrapped in a large handful of rice, instead he placed a smaller piece of fresh fish on top of an oblong shaped piece of seasoned rice, firm enough to handle, handy indeed as now it is traditional to use your fingers to eat sushi, often wrapped in thin sheets of seaweed paper. And how it has evolved since then, still a tasty mixture of rice and vegetables and either fish or other fillings it is actually a balanced mini-meal due to the different food groups that the ingredients come from. Sushi isn’t just about flavour, it is about the balance of flavour. 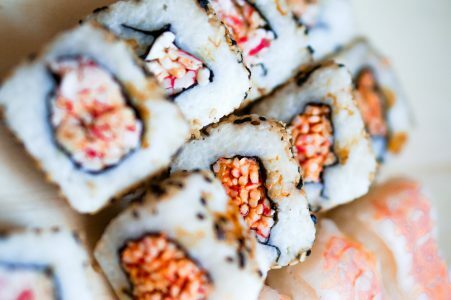 Sushi represents a “fifth taste” after salt, sweet, sour, and bitter. This fifth taste, orumami, is also found in asparagus, tomatoes, cheese, meat, and kelp. Add is the variety of different kinds of sushi and some dips of soy sauce and the hot Wasabi mustard (handle with care!) then you can present a fabulous array of fresh tasty food. We often mix that with some warm dishes like spring rolls, prawns or satay sticks on skewers for both flavour and presentation and also as it is a fun and easy way to eat ensuring it always goes down well for any business event or party where a dash of style and some exotic unusual flavours will be appreciated to help make the event special. But the story is still evolving as Western influences have sparked new styles of sushi, such as California rolls, while not authentic are one of the most popular choices. Along with the many elaborate ‘fusion’ creations more often seen at upscale Sushi restaurants now we all want to try them and demand for sushi is only increasing and seems to be continuing to evolve. If you have a favourite then ask us to add it to our existing sushi menus. Don’t worry we would practice first! The earliest report of eating sushi in the UK is actually relatively late with a mention of sushi being consumed when Japans Crown Prince Akihito visited Queen Elizabeth II at the time of her Coronation in May 1953. If you want to make a day of it then June 18 is International Sushi Day, but for us we serve it at least twice or three times each week, so every day could be sushi day. Now you know a bit more about the subject ask for our Sushi menu.